The St. Andrew’s United Church was a beacon for Sea Captains, rounding the bend of the Richibucto River. It must have been a welcomed sight after lengthy periods at sea. 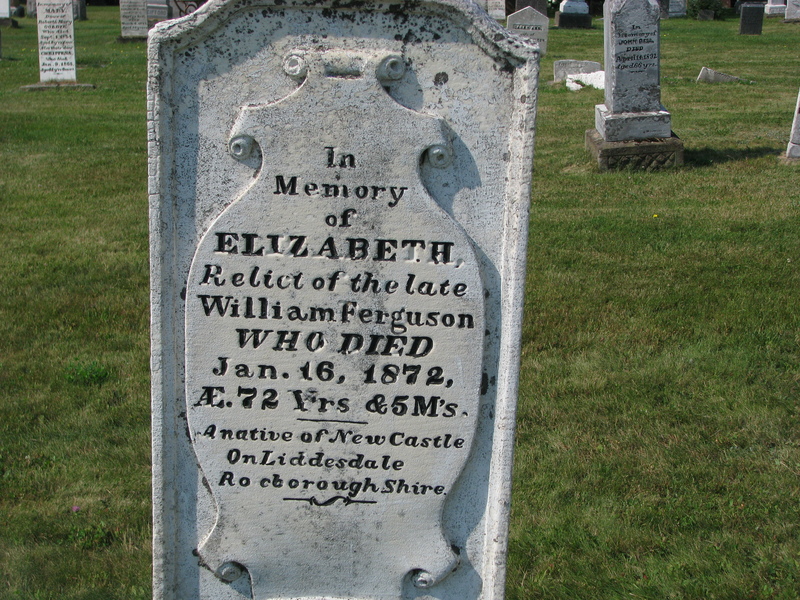 This is the first of several stories to come, about the sea Captains laid to rest in the St. Andrew’s United Church graveyard and the earliest settlers they brought to what is now called Rexton, New Brunswick (formerly Kingston). The first in this series is Captain Simon Graham. Captain Simon Graham was born July 26, 1796 in the civil parish of Colvend of Kirkcudbrightshire County in southwestern Scotland. According to records, the home where he lived is still standing in Rockcliffe. Simon’s wife was Anne McEwan. Captain Graham came to Richibucto River in 1827. He purchased 100 acres in Galloway (formerly New Galloway) for £45 from James McLellan and built a small house (which is no longer standing). I was not able to find information about Anne’s origin, year of dath or where she was buried. However, her name shows on the deed to the property. It appears she accompanied Simon on some of his voyages, such as on ship Pereqop to England in 1885. Simon and Anne had three children, all born in Scotland. Daughter Annie married James McAlmon from Galloway, NB. in 1839. Their second child, James died at sea on the voyage to Canada at 2 years and 7 months. 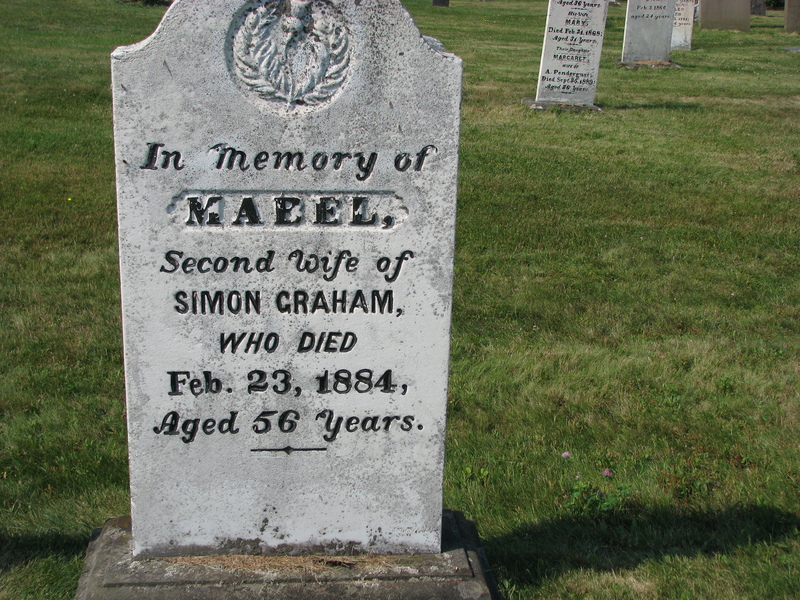 Graham’s third child, Simon Jr., became a merchant in Rexton and married Martha Girvan in Galloway in 1853. When Simon retired he moved from Galloway, NB to a small house right on the corner of River Street and Route 134 (Main street leading over the bridge) in Rexton. It is unknown how much time Simon spent in Richibucto River area since he had 84 voyages on record so one might presume he spent more time at sea than at home. 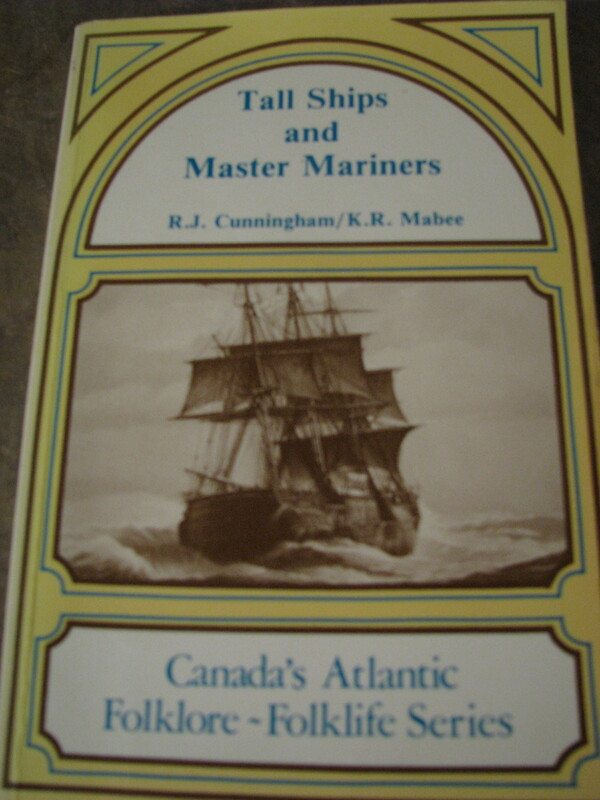 Graham became a Master Mariner and sailed between British Isles and Canada, along the coast in the USA and of course to ports nearer to Rexton. On a voyage around Cape Horn he experienced munity of his crew—he locked some up in South America and put others aboard British naval ship. It was common to have munity on these voyages due to the extended time at sea, terrible weather and food with no time on shore. According to records, Captain Graham related to John Paul Jones, a Scottish sailor who became the first well-known naval fighter in the American Revolution (died 1792, Paris). Jones’ belongings were sent to a relative in Scotland, including a quadrant, an instrument for navigation. John Paul Jones’ quadrant was given to his nephew – Simon Graham. As a Captain, Simon Graham engraved his name on the quadrant before he sailed. The rough painting on the inside of its case depicts John Paul Jones shooting a sailor for attempting to lower the stars and stripes and that of his ship the Bonhomme Richard. Simon Jr.’s daughter, Mrs. Mary Jardine of Rexton, confirmed the history of the quadrant and presented the quadrant to J. S. MacLaren*, who was the Governor General of Canada. It is now located at the United States Naval Academy Museum in Annapolis, Maryland. Captain Graham brought many of the earliest settlers to Kent County, some aboard the Dickes. To survive here in that time would have been extremely hard. Few settlers came to these shores with much money or idle time. Generally everyone was from a similar social class in those days. Several families settled in New Scotland, which is now known as Galloway. The cemetery indicates its former size. From my research I estimate that Graham brought the Walker clan to Kent County during the late 1820’s. My grandmother Sarah Walker of Spring Brook was a direct descendent of the Walkers. John Walker was buried in the St. Andrew’s United Church graveyard. His stone is located just to the right of the current walkway. As the story goes, Mr. Walker brought his own stone with him from Europe. Life was hard and he did not live long here. They carried his body by boat from South Branch to Rexton for burial, or so the story goes. Another early settler was Andrew Dixon, who arrived on the Dickes Ship and was laid to rest at the Methodist Point Cemetery. His grave site is unmarked. My uncle, Captain Robert Lawson, married Helen Dixon, a direct descendent of Andrew Dixon. Her brother’s name was also Andrew. Graham sailed the Hercules, built by John Jardine in Jardinville, New Brunswick. At 757 tonnes the Hercules was the largest ship built to date in New Brunswick. Shortly after setting off to Britain on a Governor’s pass (the right to sail from point of construction to point-of-sale), the ship immediately began taking on water due to poor caulking. To make matters worse, the build of the ship caused it to roll badly. It was not safe with the deck load. After repairs to the ship in St. John’s, Newfoundland, Graham continued to Liverpool, England where he delivered the ship to new hands. The last ship that Captain Graham sailed was the Patterson built by John Jardine in Jardinville, New Brunswick. On its first voyage his ship ran aground at the Madeleine Islands, but there was no loss of life. The ship may have been salvaged because there are later log entries of the ship making passage to England. Few records survived the years; Graham’s sailing logbook is one of the few remaining. Graham recorded only the basics about his trips, seldom noting any other observations, however it does contain some poetry. If only Captain Graham had kept personal notes, I am sure there would be very interesting stories. 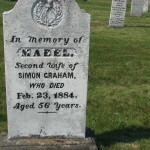 Captain Graham died on April 17, 1878 at age 82 and was laid to rest at the St. Andrew’s United Church Cemetery in Rexton. His stone is located near to the right of the front walk leading into the church in the first row. 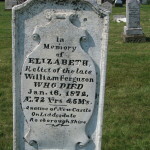 Mabel was the second wife of Captain Graham and is buried in the grave beside Elizabeth Ferguson. 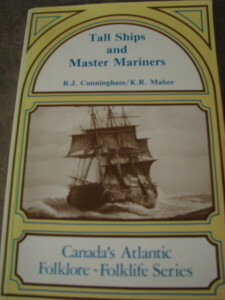 If you are interested to read more about Captain Simon Graham pick up the book Tall Ships and Master Mariners by Ray Mabee of Moncton and Bob Cunningham of Sackville. * J.S. MacLaren’s family originally came from Richibucto, but moved to St. John.